There’s no denying that craft breweries are hot, and the Hershey Harrisburg Craft Beer Country offers some of the best microbreweries in the central PA region. In fact, many of their craft beers have been highlighted nationally for their uniqueness. To help celebrate these beers safely and comfortably, Premiere #1 Limousine Service patrons are invited to reserve a seat on one of our exciting, fun-filled Hershey beer tours. Our Premiere #1 Limousine Service brewery tour deals are offered every day of the week. For an additional fee, you and your guests can be picked up outside the Harrisburg or Hershey area. 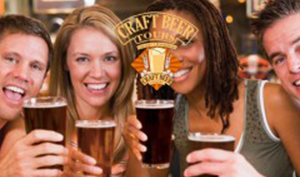 You can choose to start your Hershey, Pennsylvania beer tour during the afternoon or evening hours. If you’re visiting from out of town, call us at (717) 616-8995 for suggestions on where to stay while you’re visiting the Central PA area. Are you organizing a bachelor or bachelorette party? Not sure you want to head out to night clubs throughout the Susquehanna Valley? Are you trying to put together a surprise anniversary present or birthday celebration? A Hershey, PA brewery package through Premiere #1 Limousine Service could be the perfect solution. Even if you have more than eight people attending your event, we have vehicles to accommodate your needs. Contact (717) 616-8995 for more information, or send us a message using the form below! Why worry about designated drivers? With Premiere #1 Limousine Service, you can safely tour several of the hottest craft breweries in the region. No matter how much you have to drink, our chauffeurs will get you home safely. It’s one of the most responsible ways to indulge in the microbrews in and around central PA. Remember that your safety and comfort are our goals from the time you step into our luxury vehicles until you arrive at your destination. It’s our promise, and it’s why we continue to win awards for our service — including the 2015 WeddingWire Couples’ Choice Awards® for Limousine Transportation and the 2013 Partner in Tourism Platinum Award from the Hershey Harrisburg Regional Visitors Bureau. Book your brewery tour today!